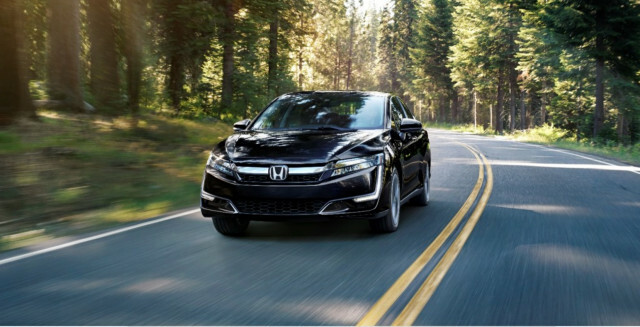 While there will be three distinct powertrains offered in the Honda Clarity mid-size sedan, most U.S. shoppers will only ever see one of them on sale. That's the plug-in hybrid, which will go on sale "later this year" as the sole Clarity to be offered at all Honda dealers. Now the 2018 Honda Clarity Plug-In Hybrid's electric range has been certified by the EPA, and it's come in at a higher-than-expected 47 miles. That puts the plug-in hybrid Clarity in the top three for battery range, following the range-extended electric BMW i3 REx (with 97 miles of battery range) and the plug-in hybrid Chevrolet Volt (with 53 miles). It surpasses the battery range for plug-in hybrid versions of the Ford Fusion, Hyundai Sonata, and Kia Optima mid-size sedans. Once the battery is depleted, the 2018 Clarity Plug-In is rated at 44 mpg city, 40 highway, and 42 mpg combined, which equals the 42-mpg combined rating of the smaller Chevy Volt. When operating in electric mode, the plug-in Clarity is rated at 110 MPGe, against the Volt's 106 MPGe and the i3 REx at 111 MPGe. Miles Per Gallon Equivalent, or MPGe, is a measure of how car a vehicle can travel electrically on the same amount of energy as contained in 1 gallon of gasoline. The car's powertrain combines a 1.5-liter Atkinson-cycle inline-4 with Honda's two-motor hybrid system, which takes the place of a transmission. One motor, rated at 135 kilowatts (181 horsepower) and 232 pound-feet of torque, can drive the car itself under many circumstances, especially at lower speeds. It draws power from a 17-kilowatt-hour lithium-ion battery pack located behind the rear seat; Honda quotes a recharge time of 2.5 hours when using a 240-volt Level 2 charging station. The default driving mode, Normal, runs on battery power until the pack is depleted and then essentially turns into a conventional hybrid car. The Econ mode reduces power draw and cabin ventilation to extend the range, at the risk of slower acceleration, while the Sport mode uses the battery and engine more aggressively. A separate toggle for "HV" (or Hybrid Vehicle) mode can be selected with any of the three driving modes; it operates the car and maintains battery charge for later all-electric use. 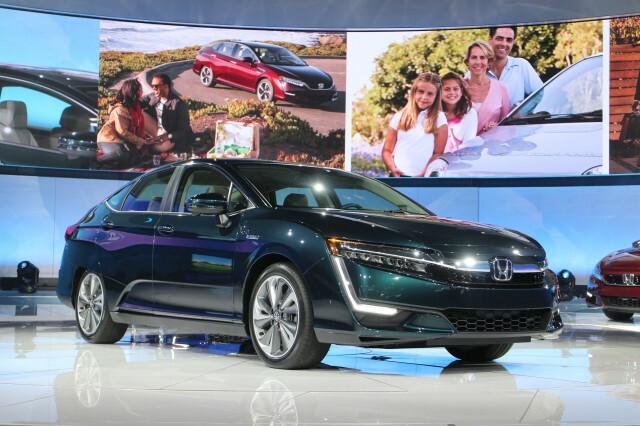 The 2018 Honda Clarity Plug-In Hybrid will be offered in standard and Touring trim levels. Pricing will be released closer to the car's on-sale date. Honda will also launch a "dedicated hybrid car" next year, about which no details are yet known, and is expected to launch a CR-V Hybrid compact crossover to join its redesigned 2018 Honda Accord sedan. Meanwhile, the Honda Clarity Fuel Cell version is offered for sale only in California, which now has 35 hydrogen fueling stations operating. The Clarity Electric version, with a battery range rated at just 89 miles on a full charge and a combined energy efficiency is 114 MPGe, is on sale only in California and a few other states.